Happy Labor Day! I hope you're enjoying yours, and maybe getting some shopping in. But before you do, I made a video of my favorite makeup products. It's called the Ride or Die Makeup Tag and I'm tagging YOU! AND THERE'S EVEN MORE on my Youtube, plus the reasoning behind each item! 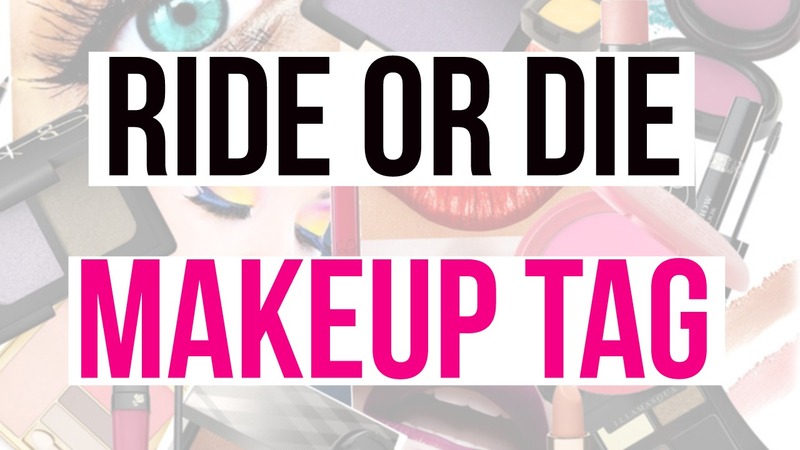 Let me know you makeup must-haves! Its always good to have those products that you know you can rely on. THe ones you always come back to. I'm with you, I loved that original Miss Dior Cherie perfume. I was sad when they reformulated it! I'm in the process of finding new favorite products because my skin dried out quite a bit this year, so my old favorites when I had oily skin don't look good anymore. I am horrible because I have yet to try theBalm Mary Lou Manizer until today. I know it has HG status for many but for some reason I never bought it for myself. I also love Buxom lipgloss. So going to have to do this tag. I've heard Armani foundation is really, really good! I need to look into that eye shadow palette. Watching your video now! I love that primer and I'm all about MAC lipstick. A few others I'm going to have to try! Lady Danger is one of my favorite lipsticks by MAC. It's like the perfect matte, orange red. I need to check out some of these other favorites! It's really fun to read all the favorite products from a bunch of different people. I might have to do this tag soon! Ahhh I've been meaning to do this tag! I need to film mine soon. I see some of my favorites in your list! Going over to watch your video soon! You are too cute on camera! Ooh, I am all about Laura Mercier Foundation Primer Radiance and drugstore eyeliner called Clio.. And I am totally loving Chanel Cream Blusher..
Just didn't want to skip the comment today :( Forgot - your hair is impeccable! The LORAC Pro has been on my wish list for awhile. It is so pretty!!! And I have been meaning to get the Kat Von D liner as well because anyone who has tried it has loved it. The RCMA No Color sounds interesting! So you like Becca better than Anastasia? I have been trying to decide which highlighter to try. There are so many out there!!! I love peachy pinks for blush too! I NEED to do this tag! 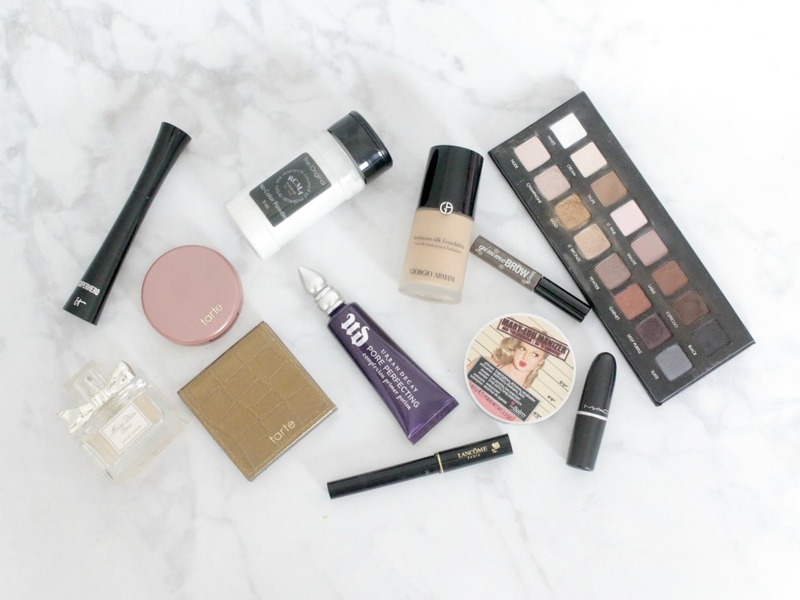 From yours: I really want to try the Armani Foundation, the RCMA powder, and the It Cosmetics concealer. I JUST purchased MAC Fix+ for the first time the other day but haven't got to use it yet, I'm excited to! I'm totally with you on the Kat Von D eyeliner! It's so good! I also really love the Tarte blushes that I have too! I would love to see your review of the IT Cosmetics Bye Bye Under Eye Illuminator and to learn the reasons that you love it. Loved hearing your answers! I totally agree about the blush and bronzer. Those would probably be my answers too. Mascara would be the hardest for me to decide on, as well. I haven't tried either of the ones you mentioned, but I will be giving them a try soon! We def got some similar favs! Going to check out the video. I love how you showed all of your favorites products in a simple and clean post!